Known as kyusu, Japanese tea pots are objects of beauty and practical equipment. How to buy a tetsubin, small kyusu and houbin. When you shop for a kyusu, there are several things to keep in mind. First, understand that they are often classified based on where they are made. The most famous pottery-producing region of Japan is Tokoname, one of the Six Old Kilns of Japan. Next, consider what type of tea you are brewing. When drinking a high grade sencha or gyokuro, you should use a small Japanese tea pot, such as a houbin or small kyusu (both explained below). 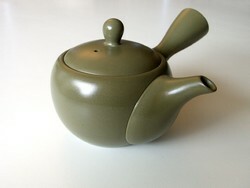 When drinking a low grade sencha, hojicha or genmaicha, you should use a larger tea pot, such as a tetsubin. The larger Japanese tea pots generally have an arched handle across the top for pouring. Also, consider the materials and style. Look for materials that meet your needs in terms of durability, weight and ease of care. For example, a tetsubin is durable, but may be too big and heavy for you to lift comfortably. Clay is charming. Porcelain is attractive and versatile, but you may find it too plain after a while. Like Goldilocks, you may need to shop around until you find something that is "just right". The most popular of Japanese tea pots, tetsubin is traditionally used as a kettle for heating water when making sencha tea. Today, it is sold mostly as a brewing vessel that is good for retaining heat for a period of time. This type of tetsubin is often elaborately decorated with relief designs on the outside. The interior is coated with a layer of ceramic enamel to lend itself for brewing tea. The attractive appearance and stylish design ensures wide appeal. The inner coating serves two purposes: it prevents rusting and prevents the tea from tasting metallic. For drinking gyokuro and high grade sencha tea, a small pot without a handle called houbin is preferred. 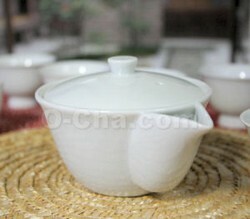 Since high grades are brewed at a relatively low temperature, the tea pot can be handled safely without a handle. The smaller size makes it easy to brew expensive gyokuro without being wasteful. For a high grade sencha, a small kyusu is the preferred pot. It is a small pot with a long, hollow handle on the side. The hollow design of the handle means that it stays cool even when the pot is filled with hot water. The angle of the handle makes it easy to pour. Kyusu can be made of porcelain or clay. It can be either quite plain and rustic in appearance or decorated with lively designs. The best kyusu have special clay strainers built into the spout to filter out particles of tea. However, less expensive models are available that have stainless steel strainers built in instead. For example, the kyusu above has a built-in stainless steel mesh strainer to catch tea particles and keep them out of your cup, and its 9-ounce size is perfect for making tea for one. Although it does not claim to be handmade by a master craftsman, it is still attractive and has good reviews for being lightweight and well-built. 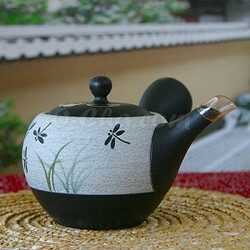 Another good option for the solo tea-drinker is this bold little black and red Tokoname clay pot. This tea pot is made of clay, and features a handcrafted clay strainer in the spout. It brews just enough for a single serving. It got excellent reviews, with the reviewer noting that the clay improves the flavor of green tea. 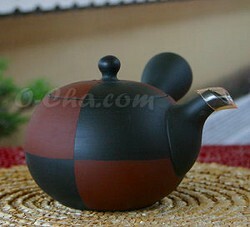 Like much Japanese pottery, the black and red clay pattern is simple yet striking.